When it comes to Jessica (who was born and raised in the San Fernando Valley, but is now living in San Diego) you can almost always expect to see a smile on her face, but if she is put to the test her competitive nature takes over and her game face is on! She’s been involved in sports and fitness forever! She played volleyball throughout school, did some amateur boxing, and even loves and takes on challenges like marathons, sprint-triathlons, bikini competitions and more. She started her adult life by getting her B.A. in Communications, then ventured into the mortgage and insurance industry, and is now an avid Health and Wellness Coach, mentoring people to lead fabulous lives aiming to help them achieve their goals from the inside out. 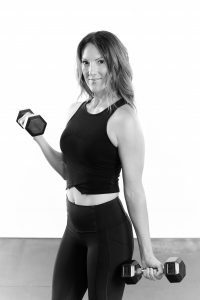 With a husband and 3 busy young kids Jessica say’s, “It’s my mission to have enough energy and strength to keep up for my family, my fitness and my business.” In the end Jessica just strongly believes that fitness is a journey, and all one’s goals can be achieved with consistency, dedication and heart. Amen to that sister! I love HIIT! Hearts pumping, sweat dripping and pushing yourself to a level you never thought possible. High energy, great beats and loads of fun! I strongly believe fitness is a journey that never ends! You can achieve any of your goals with consistency, dedication, heart and a healthy mindset. Whatever your mind imagines, your body will achieve.